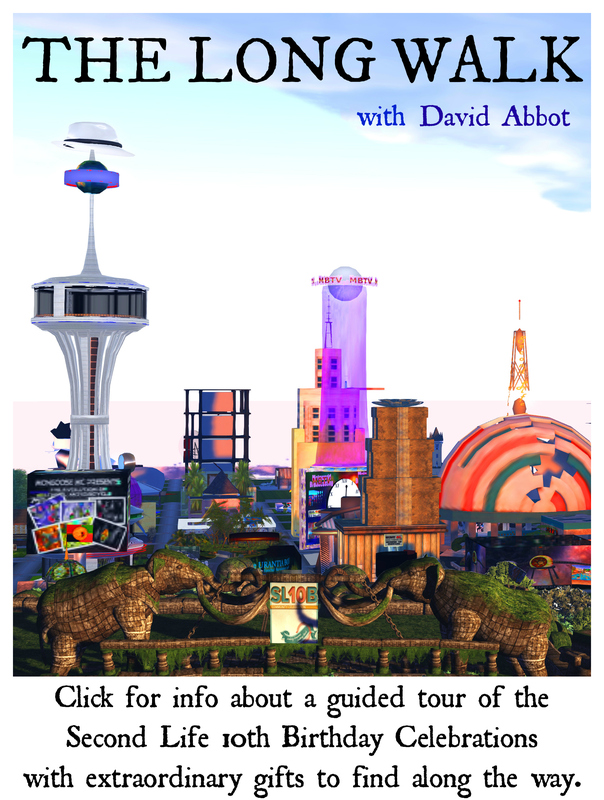 The Long Walk for the SL10B Community Celebrations – a very special hunt! Is there a Hunt at this year’s SL10B Community Celebrations? Well, yes … and then more yes. Because if your idea of a good hunt is the chance to explore new places and find amazing things … then all you need to do is come to the Community Celebrations, and look around. You’ll find the most amazing things – all jam-packed next to each other. And because SL10B is a birthday – your birthday – you’ll find presents all over the place. But as well as the serendipity of exploring the twenty amazing sims that you’ll find, there’s also going to be something special – The Long Walk. It’s been devised by David Abbott (who you may remember as the intrepid explorer in the Egyptian desert who guided you through the Hunt in the Desert at SL9B). And he’s been ably assisted behind the scenes by Rosamoo Mendelsohn of Hunt SL and by Whiskey Monday who created the striking poster you see here. So what is the Long Walk? Every day for the Birthday Week, David will be posting an account of that day’s Walk on the blog, describing some of the amazing things he sees. You can follow in his footsteps and – along the way – you will discover one or two gorgeous gifts – not in every location he mentions, but in very special places where X will mark the spot! The walk will continue throughout the week from June 16 – 23rd. In the following week, you will still be able to follow the Long Walk and find the special gifts while the sims remain open. Keep reading the blog to find out more about The Long Walk – coming soon! Next Post: Useful images for writing about SL10B, now available on the Flickr Group!